This kit uses OEM Arctic Cat Pistons from the 800 Lay-down engine so reliability and functionality is completely maintained. RK Tek has also developed a VERY unique porting package for this over-bore. Couple this with our custom billet head and you have a recipe for a very strong performer. We can also re-shape (NOT SHAVE and change bore diameter) your existing OEM head to our dome design. This allows for a total sleeper engine that will keep your secret hidden from your buddies. RK Tek has tested many pipe combinations with this new kit. We have set-ups for most aftermarket pipes and have a very good understanding of what is working and what is not. OK, here comes the best part…. This kit can be run WITHOUT an EFI control box (i.e. Boondocker Box)!! We have spent countless hours developing this kit so it can be ran with the stock fuel mapping. This is only the case when using the stock pipe and stock silencer. If any aftermarket pipe/pipes or silencers are used, then a fuel control is required. This kit runs on 91 octane PUMP GAS! There are different levels of performance (HP) with this kit. These different levels are largely dependent on the exhaust system used. Using the stock exhaust and no fuel control you can expect a solid 160+HP from this kit. If you choose to run a single pipe you can expect a solid 170+HP with TONS of low end grunt. If you choose to use twin pipes 180+HP is easily achievable but the low end suffers slightly in the 4000 to 5500 rpm band. No air-box mods are required for this kit. The running rpm of this engine is 8000 to 8250 rpms. OK, what is needed from you in order to do this kit? RK Tek needs your cylinders only! 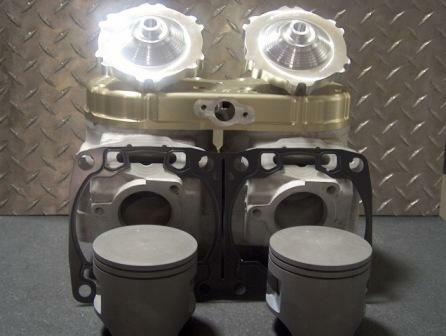 If you choose the OEM head re-shape vs. the Billet Head, then we also need your OEM head. NOTE: PLEASE remove Exhaust Flange Studs from each cylinder. Failure to remove these will result in more time to complete the conversion and added charges. ALSO: Please send in clean cylinders! Porting thick, baked on carbon build up, is NASTY! !